Some people are tree huggers. I am most definitely a leaf lover. 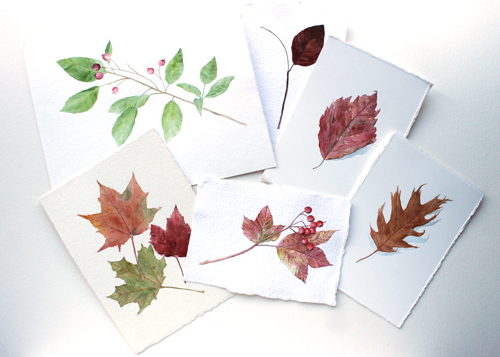 Here's a grouping of leaf paintings from the past year. I love painting them so much. It's hard to take group shots of paintings and get the lighting right on all of them. The burgundy leaf in the back is showing much darker than it is. Kind of like taking a family photo. There's always someone with an odd look on their face (usually me). My love of trees and leaves goes WAY back. In grade five, I participated in the 'Tree Bee'. This was a Toronto-wide tree identification contest for elementary school children. Our team didn't win but we were runners-up. To this day, I am pretty good at identifying trees although I won't pretend that all of my grade 5 knowledge has stayed with me. My stash of elementary school badges in a lovely sweetgrass basket my Mom gave me when I was a little girl. There seems to be good energy surrounding my painting efforts these days. Someone who saw my prints at the craft show I did recently is coming to my studio next week to look at originals. That means I need to get my studio cleaned up! It's good to have the motivation as I am famous for putting it off. I'll post a photo of it for sure. I also have been commissioned by someone who found my work online to do a flower painting as a Christmas gift. Another lovely opportunity. With the recent interest in my originals, I have found the motivation to put some of them in my Etsy shop for the first time. Up until now, I've only had prints and cards there. I'll be adding more in the weeks ahead. I used to sell a lot of originals in the days when I was doing trade shows with my Florescence card line. I often would decorate my booth with framed paintings and fresh flowers. Shop owners would ask about buying the originals for themselves or they would ask if they could sell them on consignment in their shops. Original paintings of mine are in homes in Canada and the United States. But, I guess because I didn't paint for a long time, I'm having extra trouble letting go of them recently. I get so attached to them! It makes so much more sense for them to be loved and appreciated somewhere and not just live in a drawer in my studio. Lots of thinking lately. Since we're on a leaf theme, I'll close with a sweet gift that Emma picked up for me on the way home from school today. The yellow maple leaf actually fell right onto her as she walked, so it was begging to come with her. Then she found the little snail that looks like it was made for the leaf. Maybe another painting? Aw, I'm so happy for you that there's a raise of interest in your originals ! And I understand you totally when you say you have a hard time to let them go in new homes ! I just feel the same sometimes, specially if it's a special project. We pour so much love & care, that our projects become like little babies of ours. I've used that analogy before too and it fits because they really are part of you. All so lovely Kathleen! And by letting go of finished work, you're making more room for new pieces in your life. Thanks, Julie. I think I have to keep some for sure. There are always some paintings that hold more personal meaning but I think it is a good thing that I am starting to let go of some too. Thanks very much for all of the kind words, Annamaria. I don't envy you being in the middle of selling your house. We've done that twice in the past and, while it's lovely to have everything sparkling, it doesn't really feel like 'home'. Wow!! These are incredible, you're so talented!! I've never come across your blog before and I'm so glad I did, it's so inspiring! It is strange letting go of something you've worked on hard, but how lovely that somebody wants to make it a part of their lives. Thanks so much, Nikki. So glad you found my blog and I appreciate your lovely words.